I spent much of this morning reading the transcripts of a massive interview with Colin Johanson and another, much shorter, interview with Mike Ferguson. The Johansen interview is a few days old and has been much discussed elsewhere. The Egg Baron focused on the information on the new Guild events and Healing The Masses has a detailed analysis of the WvW material. Colin Johanson's previous interviews and pronouncements have tended to rub me up the wrong way somehow and this long series of ambling, amiable replies to some rather soft questions is no exception. Filter out the fluff, though, and it's very revealing in what it lets slip about the underlying mechanics and state of the game. Does anyone know the way out of this mess? And so it goes on. Read the whole thing for many more examples. It's always surprising to discover that something that has had so much money spent on it, took so many years to be ready and has been so successful can still have so much structurally wrong with it and have such limited resources to make improvements. At one point Colin Johanson happily latches onto a gushing assertion that, unlike most other MMO studios, ANet are "open with the process". Which is all very well, only aren't all these deep infrastructure problems you keep bringing up as the reason so many things can't be done the very same things you were building during those five pressure-free years? If it was "ready" when you put it out, why does so much of it not work? The takeaway from this seems to be that due to a lot of less than optimal design decisions made before launch, most of the first year of GW2's life is going to be taken up with trying to rebuild the house from the foundations up while we're all still trying to live in it. We shouldn't expect much, if anything, in the way of real new content, by which I mean new explorable landmass, this side of an expansion (the development of which is probably where a lot of the effort is allocated right now although no-one's being very "open" about that). I remain sanguine. 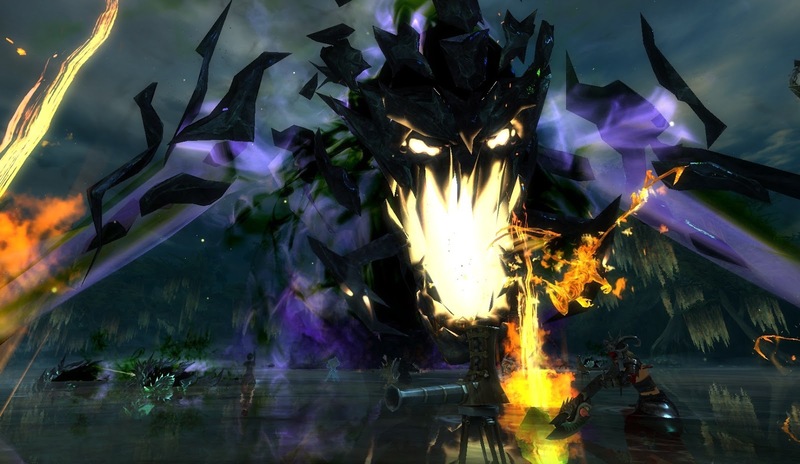 GW2 turns out to be an MMO like any other. It wasn't finished when it launched, it will never be finished. Bits of it work, other bits don't. Every time one thing gets fixed something else will break. That's MMOs for you. I get the strong impression that there's still something of a disconnect between the developers and their audience in these open discussions, but that's always the way. MMO players are a disparate, rag-tag bunch with countless conflicting agendas and expectations and trying to communicate with them at all must be a nightmare. As for MMO developers themselves, the concept of hubris seems to be all Greek to them. Even the Greek ones (/wave Aventurine). 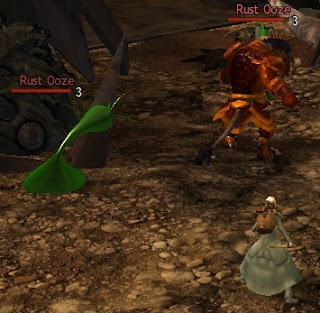 J3w3l at Healing The Masses has a piece up about starting a second character in GW2. It's fascinating to read a view of this aspect of the game (indeed the genre) from someone who takes such a diametrically opposed view of it as I do. 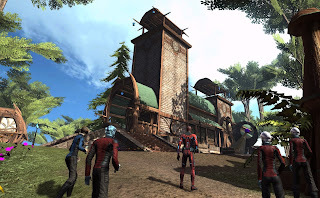 To me MMOs are entirely about alts and leveling them up; once a character hits the level cap they are pretty much done and it's time to start a new one. That's if I can wait that long. I have six level 80s in GW2 now, all different classes. I'm currently leveling up a Mesmer who should ding 30 today and after that there's just guardian to go. Well, I say that - in fact since I have two accounts and ten character slots I 'll almost certainly make two more characters and level those up as well. A good deal of my time is spent duoing with Mrs Bhagpuss, who has a similar number of 80s, it being both our intentions to have the full set of all 8 classes at 80. Are you sure those things are, y'know, safe? In most guilds I've been in over the years there's been a fairly equal mix of players, some with several characters that they played regularly and others with one Main and, after a good long while, one Alt. It's hardly surprising that many players with one Main often had a highly sophisticated and knowledgeable understanding of the the class they were playing but were vague in the extreme about what most of the other classes in the game could do. The altaholics, on the other hand, while often not being more than solid but unspectacular players of any of the classes in their roster, tended to have a better grasp of group dynamics and were much more open to and understanding of the flexibility, potential and synergy of classes operating in unconventional roles or combinations. I'd say that in most if not all of the MMOs I've played for any length of time the classes play very differently indeed. Playing a Disciple in Vanguard, for example, is a totally different experience to playing a druid - you could be playing a different game. Same with playing, say, a Necromancer and even a superficially similar class such as a Magician in Everquest. The mobs you kill to level up may be the same but almost everything else is completely different. Deep knowledge, I haz it. Deep knowledge of the subtleties and capabilities of the class probably isn't needed in most leveling games and solid understanding of and competence in the core class abilities and tactics will see you through most solo and single-group content you meet on the way to the cap. On the harder stuff that comes after that I imagine you may want a real specialist. I wouldn't really know because it's when that stuff comes in that I generally bow out and make another character. GW2, though, is an extreme example. Not only are all the classes really very significantly different to play, each differs widely within itself. Swapping weapons can be like swapping classes, as can slotting in different traits. I'm not sure I've ever played an MMO where such a range of playstyles can be accommodated on a single character without a respec. Rift, with its multiple Soul system runs it close, but changing from one soul to another never felt as fluid or intuitive as swapping from Staff to Daggers on an Elementalist or swapping Kits on an Engineer. 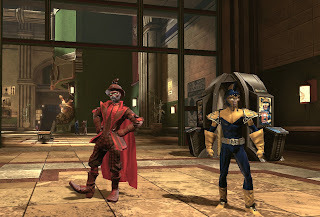 EQ2 has a ferocious number of classes, over two dozen at current count, but while some vary wildly from each other, the particular subtleties of, say, Dirge and Troubadour or Brigand and Swashbuckler are lost on me. Life was so simple back then. And we had hats. 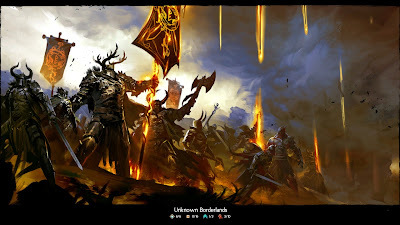 The classes of GW2 were one of the aspects of the game that least interested me in the couple of years leading up to launch. 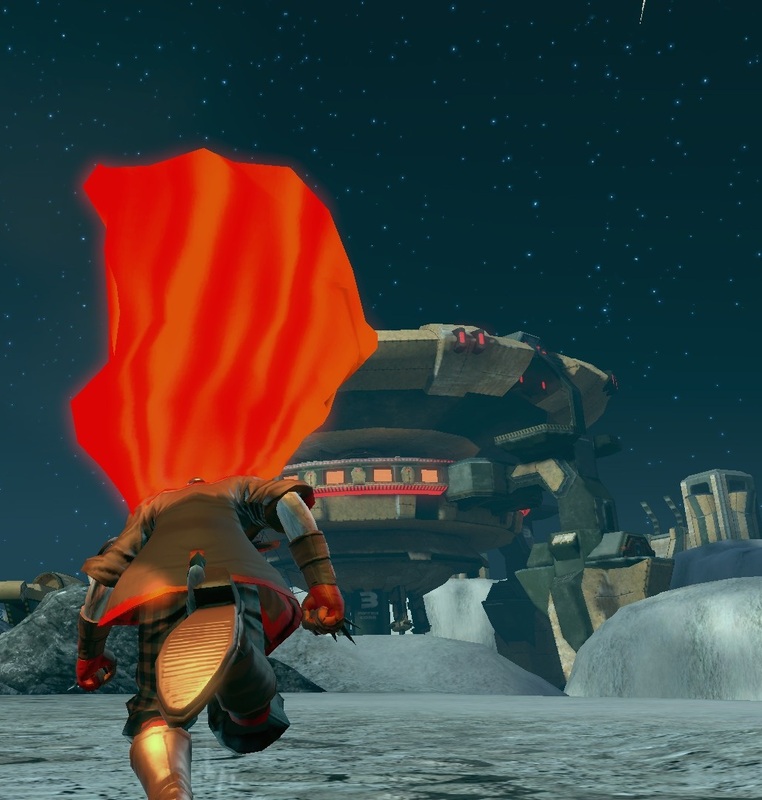 All those slow, teasing build-ups to each class reveal that generated such excitement left me cold. 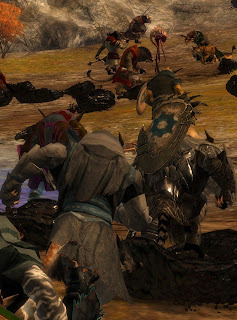 I didn't really have a favorite class from Guild Wars but I'd been playing a ranger through Eye of the North to get some Halls of Monuments points (now there's a part of the game that fell into a black hole on release. When was the last time you visited yours?) so when the beta rolled round I went with that. I stuck with Ranger all through beta, began with it again at launch and didn't make another character until the ranger hit 80. I was very happy with it, it was absolutely the right choice for learning the game and it's probably my favorite still. When I have all eight classes, my ninth character will be another ranger. An Asura this time, because I frequently find that even replaying a class I've played before as a different race makes a huge difference. Warrior. No, Warrior. Yes, "really"! Even in MMOs where there is no statistical variation in the races, playing the same content as a three-foot high gnome feels nothing like playing it as an eight-foot tall ogre, no matter that they both be warriors. The abilities and the actions are the same but the perspective isn't and that changes everything. I see the whole world afresh that way, noticing things I never saw before even in places I've been a hundred times. Playing GW2, at least as a ranger, didn't turn out to be the paradigm shift many hoped, as I pointed out all the way back in beta.It turned out to be a lot of fun all the same, and in the end it did have its share of surprises. I certainly got one when I began to work through the rest of the classes. Engineer was utterly different. The tactics required were so much more complex but when they worked the pay-off was huge. My Engineer could do things my ranger never dreamed of doing. Then I played a Necromancer and discovered what power really means. And so on. I'm someone who can play through the same content repeatedly and get something new out of it each time. I'm not easily bored and I am easily entertained. Even so, leveling six characters through 80 levels in one game over the course of as many months ought to tax anyone's ability to keep themselves amused. Last night I spent a wonderfully entertaining and enjoyable four hours achieving map completion in Snowden Drifts playing my Mesmer in a duo with Mrs Bhagpuss's new Necromancer. Drifts is a map I first explored in Beta and which I've explored extensively with several characters since. That I was able to do so says volumes both for the loving care and attention to detail with which the maps have been designed, but especially for the immense replayabilty baked into the class structure of this game. And, of course, to the enormous pleasure to be gained from playing these games with someone you love. Two small news items caught my attention this week. Guild Wars 2 is having a sale on bag and bank slots until 26th February, the very day EQ2 patches in bag sorting. When I decided to start a blog a couple of years or so back, I already had the name and a clear idea what I intended to blog about. I was going to write about one of my very favorite aspects of MMOs, one of the main activities that drew me into the genre in the first place and kept me hooked all these years: inventory management. My first post here was emblematic of what I intended. I even called it "My Bag". A handful more posts on the topic followed but the theme soon sank out of sight under the tsunami of opinion, reportage, whimsy and general MMO noodling with which anyone who visits here now and again will be all too familiar. Despite my inability to stay on message, however, I'm still extremely interested in inventory management. There's little I like better on a Sunday morning than a long, leisurely browse through my imaginary backpacks, picking up beautifully-drawn icons of logs of wood and chunks of ore, sorting medallions, sigils and runes into tidy stacks, poring through piles of weapons and armor deciding what to keep, what to sell and what to hand on. 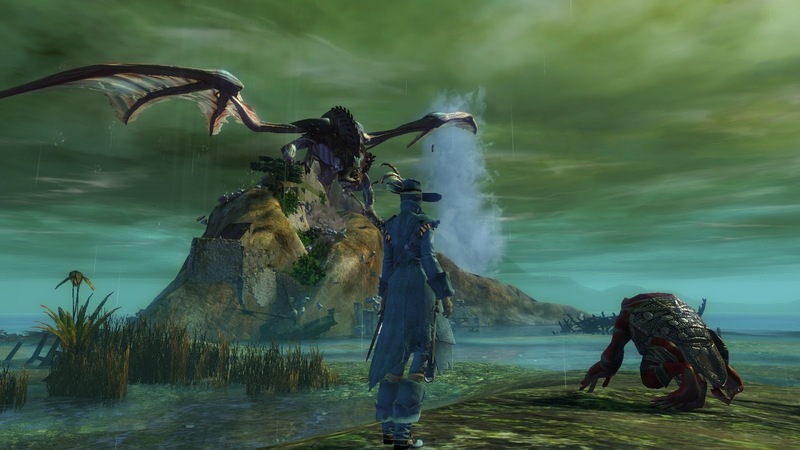 When it comes to inventory, GW2 and EQ2 provide an instructive contrast in approach, both from a player's and a developers point of view. 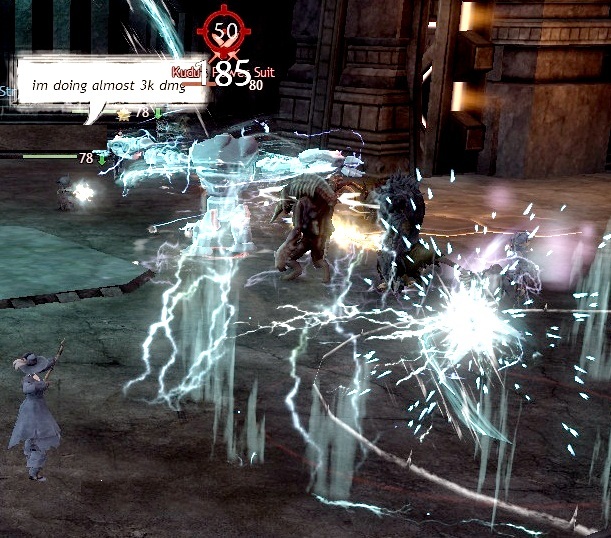 Both games operate on a form of free-to-play, generating at least some of their income stream through cash shops. In the classic F2P model, inventory space has tended to be used as a key driver of income. Back when I was playing, I remember tiny bags and very limited storage being baked in to both Allods and Runes of Magic, generating intentional frustration which the cash shop stood ready to relieve at the flick of a credit card. EQ2, on the other hand, converted from a subscription model that offered what is probably the most profligately generous of all MMO inventory systems. Like Everquest before it, EQ2 sends you out into the world with more storage at level 1 than many MMOs allow you when fully extended, expanded and kitted out at level cap. Even under the very first, most restrictive version of the EQ2 F2P template, a Bronze starter potentially had a couple of hundred inventory slots. The irony is that it was under Allods extremely restrictive regime that I was able to hone and refine my own inventory management skills. 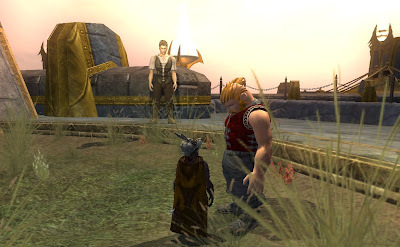 Faced with the choice of keeping everything I owned in what would barely pass for a Halfling's waistcoat pocket in Norrath or paying real money for really not that much more, I opted for the former and learned to sort, sell and send smart. Before that, spoiled by the vast vaultage of the Norrathian banking system and the cavernous backpacks and boxes knocked out for a pittance by Norrathian crafters, I'd been in the habit of keeping everything. If I ever did run out of space I'd just create another character and presto, another few hundred empty slots! Suddenly, thanks to the developers of Allods and other penny-pinching, money-grubbing game-makers with their selfish desire to earn a living, feed their families and keep a roof over their heads, I learned if not to love then at least to accept the tiny bag. Moreover, it was in Allods that I also overcame my irrational fear of automated sorts. Let's not go overboard here - I still don't like systems that shake up my bags and leave everything tidier in a microsecond than I could get it in a month of Sundays. Those invisible sorting elves are having all my fun and making me look bad while they're having it. But sometimes you just need stuff sorted and fun has to take a back seat. The upshot is that I've played GW2 for six months without feeling the need to buy any bag space whatsoever. I've thought about it a few times. My mouse pointer has even hovered over the padlock on that second bank vault. In the end, though, there are two things stopping me clicking through and spending real money: I have enough space to get by without feeling frustrated and the cost of adding more is too steep. Even at 20% off, each new bank vault costs around £5 and each additional bag slot around £3. Too much. Quite a lot too much. Of course, I could convert in-game Gold to Gems and pay that way, but still, gold is hard to come by and I just don't need the extra space that badly. Compare that to EQ2 where even though I don't really need more bag space either, SOE's frequent SC sales sometimes make it so so cheap to add extra storage to my Silver accounts that I'd be crazy not to take them up on it. It seems to me that GW2 could have handled the sale of inventory space better, both in and out of the cash shop. Bags in-game are extortionately expensive. All bar the basic ones require various Runes of Holding sold by NPCs at prices ranging from four silver to ten gold. This establishes an irreducible base price for each type of bag or box and throws up a price ceiling that most players won't want to push through. As the game began and money was tight, few would have wanted to go above the 12-slot bags and even now I would balk at paying two gold pieces for an 18-slotter, even making it at cost for myself. In fact, almost all my many characters manage just fine with ten-slot bags even at level 80. 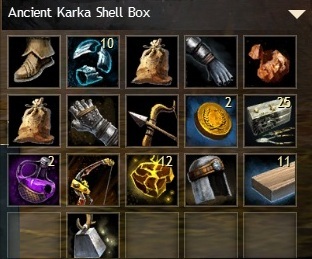 Four of those plus the 20-slot starter backpack is sufficient and the odd bonus along the way, like the 20-slot Ancient Karka Shell Box from the November event certainly helps. 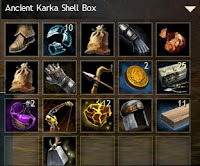 With bags being sold at a high premium both inside and outside of the game, I feel ArenaNet have efficiently and successfully trained me to be satisfied, indeed happy, with limited storage options. I'm not complaining - it works for me. I'm just not sure it's for the best for the game. As a player it means I don't even bother to make bags for myself, probably the first time that's ever happened, and as a customer the single payment I made last September, when I bought a second account, may well be the only time I give them money this side of an expansion. That second account turned out to be an excellent decision, by the way. It's served me extremely well ever since, providing me with all the character slots and storage space I'm ever likely to need, along with the invaluable option of mailing stuff to myself, something you can't do on a single account and which is incredibly convenient. What with all this and the very generous and easy to get Guild Bank and its extensions, somewhat to my surprise I find myself looking forward more to EQ2's new bag sorting options than to the prospect of a fire sale on storage in Tyria. Indeed, if I was going to take advantage of any of ANet's current promotions, it would more likely be the 30% off the game itself. I don't really need a third account though. Do I? Over many years, on many forums and in the comment threads of many long-suffering blogs, I have banged on about my belief that any MMO can be either sandbox or theme park depending on how you choose to approach it. For all that I hold this to be self-evident, however, I have little in the way of personal experience to offer to back it up. The plain fact remains that I don't really know what a Theme Park is. In fact, before I learned the term through its use in gaming, if it meant anything to me at all it would have been something like this. Such a lack of personal experience of the original has always left me at a disadvantage when the term gets thrown around in relation to MMOs. I could dimly apprehend its relevance but nothing resonated with my own playstyle, which tends towards the chaotic. I act often on whim and sometimes on whimsy. I create my own goals, pursue them for as long as they interest me then drop them without a second thought. I am not, nor have I ever been, in the habit of slavishly pursuing any path set out for me by a game or its developers. The concept of moving from ride to ride, waiting patiently or impatiently for each to start, whirling around and around until the music stops then staggering off towards the next is alien to me. Well, it was until yesterday. 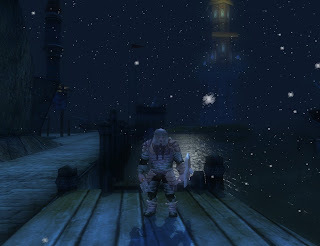 Last Friday my Thief dinged 80, the sixth of my Guild Wars 2 characters to reach that milestone. Rather than jump straight back on the horse with my Mesmer or Guardian I thought I'd goof around for the weekend. I spent all Friday night and Saturday morning sorting the bags and bank vaults of six characters. Then for an encore I organized the guild bank. There were a lot of weapons and pieces of armor strewn around and in the course of tidying it all up it became apparent to me that I had a lot of level 80s dressed in level 50-70 gear. At best. I spent most of the rest of Saturday on the Trading Post, buying and selling. People will buy anything. I was amazed. Throw any old rubbish on there and it's snapped up in seconds. Anyway, by late Saturday evening all six 80s were in what I would consider to be basic level 80 starting gear with upgraded Masterwork or better in every slot, but between the lot of them they could barely muster an average of one Exotic each. Now, I don't believe I they need Exotics to do anything I'm likely to ask them to do but I was enjoying playing Barbies so I decided I'd spend Sunday farming Rares to convert to Globs of Ectoplasm so that I or Mrs Bhagpuss (who has all craft trades maxed) could make whatever I fancied. That's how I came to see the true horror of the MMORPG Theme Park Experience in action for possibly the first time in my life. 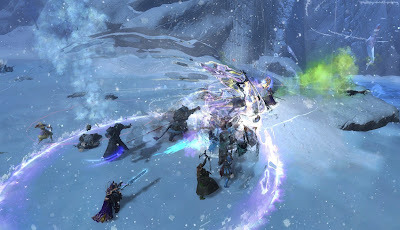 GW2 has a number of open-world events that conclude with the dropping of a chest the size and appearance of a commercial freezer. Inside this chest can be, but rarely are, Rares. Not counting the Temple events in Orr there are six of these chest-droppers. Three feature lieutenants of the Elder Dragons: Claw of Jormag, Tequaatl the Sunless and The Shatterer. The other three are The Frozen Maw, Shadow Behemoth and Fire Elemental. They keep to a strict schedule which you can find handily recorded, tabulated and regularly updated at the Guild Wars Temple website. People use this like a railway timetable. Each event has a margin of error, presumably in an attempt to create some spurious sense of spontaneity but in practice all of them pop at numbingly regular intervals. If you keep an eye on the timers you can waypoint from Frostgorge Sound in the Far Shiverpeaks to Sparkfly Fen in the Steamspur Mountains before bouncing back up via Queensdale to Wayferer Foothills and you won't be alone. On a busy Sunday the resemblance to what I imagine a real Theme Park to be like was unmistakeable. A few minutes before the earliest point at which an event could begin people would begin to gather and mill around, becoming increasingly fractious the longer they had to wait. With the exception of Tequaatl, who just appears at the ominous cry of "There's something in the water! ", all the events require some chain of pre-events to be completed. If these are right at the main location, as they are for The Claw and The Maw, the whole zerg sets to with a will. 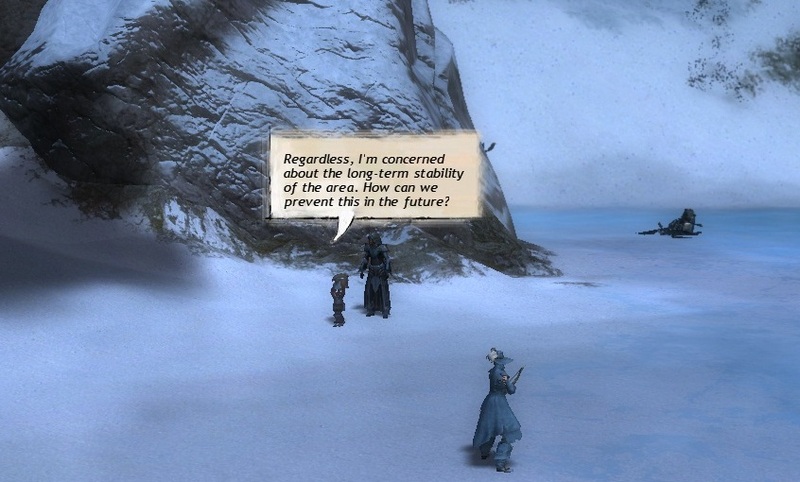 If they happen somewhere out of sight, as at The Shatterer or Shadow Behemoth, everyone shuffles around where they stand, complaining that someone ought to be doing the pre-events. Someone always is, and they are the ones who often miss out on the main event because of their public-spiritidness. By the time they hoof it over to the where the action is, the action isn't. The ride has stopped and everyone has has moved on. The dragon driven out, the Maw quiet once more, the air is filled with the wailing and gnashing of teeth of the disappointed chest-openers. "Nothing but blues" is the common refrain. In Frostgorge you could get crushed in the scrum at the nearby vendor as everyone rushes to unload their worthless rubbish. Anyone lucky enough to pull a Rare out of the box is honor-bound to link it in Map chat, mostly to prove it really can happen. Sometimes the class clown will throw in a link to a Legendary. How we laughed. I did this most of the day. The only event I didn't do was the Fire Elemental. Never done that. I did the Shadow Behemoth for the first time (the first several times) thanks to reading The Egg Baron's recent fine walkthrough. It's been bugged as long as I can remember but it's working fine now. I did The Maw, which pops about every 30 minutes or so, many times; Claw of Jormag and The Shatterer a couple and Tequaatl once. I got half a dozen or so Rares, a couple of which were upgrades that I used. I blew the rest up for Ectos. It was a fun way to spend Sunday, but it really brought home to me how mechanical and gamelike GW2 can be. This morning I read J3w3l comparing the open world of Firefall to GW2 "...every time I try to level in GW2 it is just ticking off the check list of stuff to do so I can progress to the next zone. Fill in that heart, see that vista", she says. "It could have been an amazingly large, open and complex world but now it feels entirely compartmentalised." It certainly can feel that way. Usually I don't even notice it but yesterday was a true glimpse into the Dark Side. ANet have said they intend to add more events so that any given event is seen less frequently. I would suggest they also remove Chest rewards from events completely. Increase the chance for better quality loot from any event instead. Encourage people to do events because they are interesting, intriguing, odd or amusing, not for the slim chance of a yellow weapon to destroy to make an orange one. Make it more about the park and less about the rides. Still and all, I did have fun. My job gives me a lot of holiday, on top of which I only work four days a week. Like Travis McGee I'm doing my best to take my retirement in installments. Consequently I've been able to spend much of the last ten days playing MMOs. I've also been writing about them, reading about them and, here's the dangerous part, thinking about them. While I've been taking time off work, Mark Jacobs has been doing just the opposite. He's been on a PR blitz for Camelot Unchained, the spiritual sequel to his landmark MMO of a decade or so back, which he intends to bring to Kickstarter sometime soon and, if he gets the backing and a fair wind, to market sometime around Autumn 2015. The MMO blogosphere has been ablaze with discussion (well, smouldering slightly at the edges), both on Mark Jacobs' prospects of success and the nature of the game. Probably the best discussion that I've read has been at Keen and Graev, where Mark Jacobs himself has been responding and clarifying. Apparently we've been here before with Warhammer Online, whose legendary hype train I completely missed in much the same way I mostly missed the first few years of WoW's success. 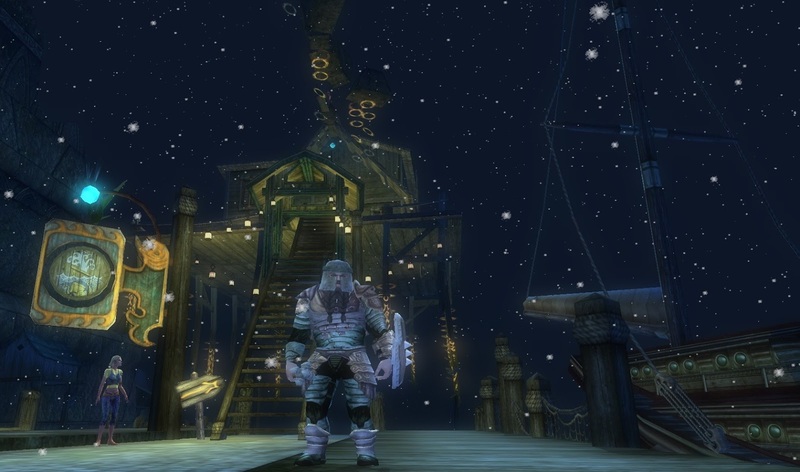 I've written and read about MMOs for as long as I've been playing them, but for most of that time all my writing and reading took place on the forums of MMOs I was playing or websites dedicated to them, so if I wasn't actively following a game I had only the barest knowledge of its existence. Nowadays I keep myself much better informed, so even though I have no particular plans to play, I'm paying close attention to Camelot Unchained. Another MMO I have a weather eye on, one that I definitely do have plans for, is Carbine's WildStar and there, too, the hype flows fast and free, not least in this typically well-made and witty promo. This lengthy preamble brings me to my point. All this hype is intended to get the players - us, that is - thinking about these games, so I've been doing just that; thinking about which I might want to play and why. When I found Everquest in 1999 (and yes, it was a little like finding God...) I was hoping for something akin to a perpetual game of AD&D, with the computer acting as DM and the general population of the entire world standing in as players. I wanted a goodly portion of roleplaying, a hefty dollop of adventure, plenty of wilderness to wander and witty banter all the way. Mostly, that was what I got. Over the years a little of that has been lost but a lot has been added. The concept of the MMORPG has stretched until it's all out of shape. At the Camelot Unchained end of the forest it's a four yorkshiremen world, uphill both ways, in the snow; down at the WildStar Wonderpark it's "how would you like it, sir?". Well, I don't know how I'd like it, that's the problem, isn't it? And I'm not likely to know until you give it to me. An unpaid job, doing repetitive tasks in my own time in order to build something to entertain myself with, isn't that what the new shibboleth of "player-driven content" amounts to? That doesn't sound like such a great offer. When I go to the cinema, they don't hand me fifty yards of canvas and a needle and tell me to stitch up a screen before I get to watch the movie. On the other hand, there's little to match the satisfaction of standing back admiring something you've made for yourself, and I wouldn't be sitting here writing instead of playing if I wasn't at least as interested in creating as consuming. Yes, thinking about things is a dangerous practice. It rarely leads to contentment. I've had a week of it and I'm more confused than ever. I don't even have a conclusion to this post. I wrote several closing paragraphs and when I read them back I realized I didn't even agree with myself so I had to delete them. One size doesn't fit all. There's a cliche to end on. Maybe I'll just have to play Camelot Unchained and WildStar and decide which I like best by seeing which I want to play more of, rather than deciding in advance that one will suit me and the other won't. Maybe I'll just have to keep an open mind - another fine cliche worn smooth with justified use. ArcheAge, Neverwinter, Dragon's Prophet (you thought I'd forgotten you, didn't you? Well I haven't! ), City of Steam, EQNext... maybe I should even try TESO. Don't close any doors, burn any bridges, leave any stones unturned. Or am I just sitting on the fence? Yesterday turned out to be Dungeon Day. I hadn't planned it that way but it didn't come quite out of the blue. A trip underground had been on the cards since February's Monthly added "Dungeon Participation" to the chore list. 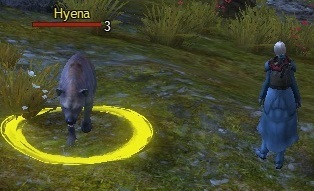 Since launch, hordes of ill-tempered adventurers and dungeoneers have found themselves conscripted into the War in the Mists to get their 50 "Monthly WvW Player Kills", something I can usually knock off in a session or two of normal play. Turnabout is supposed to be fair play, so I didn't complain too much when the addition of Fractal dungeons to the game at the end of last year brought with it a requirement to do seven of the irritating hoop-jumpers, a demand I grudgingly complied with the first month it appeared and then said "never again". I would have been quite content to ignore monthlies altogether had the Laurel system not been thrust upon us. I didn't really need the rewards we'd been getting before then. Every Jug of Karma I've ever received is still sitting undrunk in my bank, every Mystic Coin has gone unspent. Laurels, however, are different matter. Until some other means of obtaining them appears, they come one at a time via a Daily drip-feed. The Monthly completed brings another ten. If you want to buy anything worth having, and there's quite a lot in that basket, you can't really afford to be picky about what you do to get them. Golems. They look funny but no-one's laughing. Looking on the not-really-very bright side, at least we're only being tasked with completing five dungeons. We had to knock out seven Fractals, although I ended up attempting at least twice that many before I finally got the damn thing done. Also, Dungeons are at least in some fashion integrated into the world, not something bolted on as an all-too-obvious makeshift patch when the good ship Progression sprang a leak. 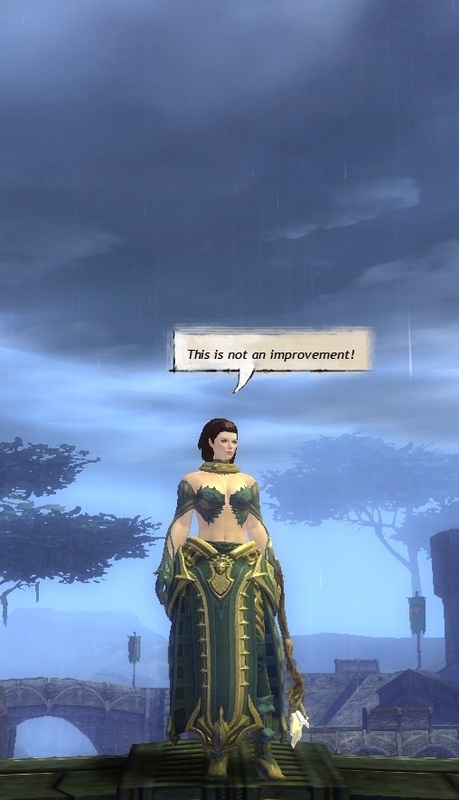 Against that, GW2 Dungeons have a very poor reputation both as examples of the form and as any kind of entertainment. The only time I'd done one before was when I'd assisted Mrs Bhagpuss in the completion of her ranger's Personal Story. That was Arah, the level 80 dungeon. It went on a bit and a lot of it was watching cut-scenes, or at least that's how I remember it. This time I thought I'd start at the other end and do the start of the Story in Ascalonian Catacombs. 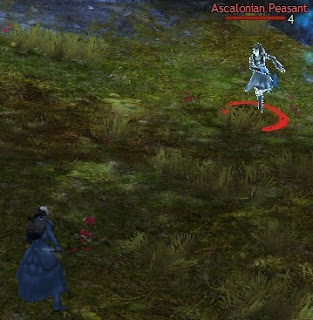 If I took one of my level 80s and joined one of the PUGs that are almost always recruiting for it when I'm in Plains of Ashford it should be a doddle. So it was, just a few minutes after logging in yesterday morning that my level 76 Thief entered The Crucible of Eternity, the penultimate dungeon, recommended level 78. I don't know why! 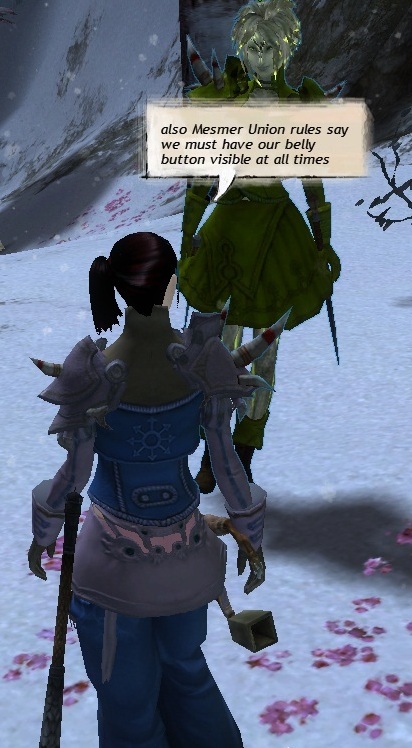 Someone was LF1M for it while I was banking in Lion's Arch and I wasn't really awake yet. These things happen. It took a long time. A long, long time. Over two hours. I think three of the group already knew each other, one had done the dungeon before and I was the only one under 80. 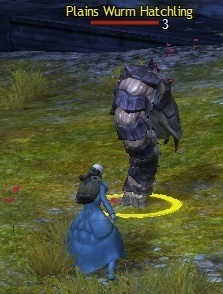 It was a pleasant group, as all PUGs I've had in GW2 have been, good-humoured and patient for the most part. Just as well since the first pull was a full group wipe. 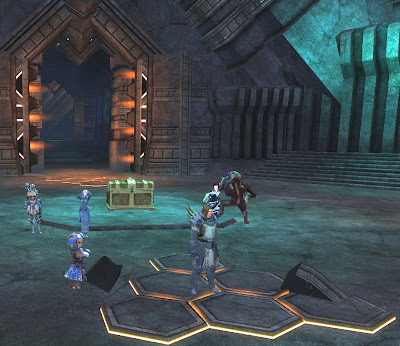 It got better after that and we progressed to about half-way through the dungeon, set in a dizzying descent through an Asuran research facility known by the not very reassuring name of The Infinite Coil Reactor. As a Thief I didn't have much to do other than try to hurt stuff and not die. I used the Shortbow a lot. No-one complained. We got hung up for a long while on some annoying Inquest gnomes Asuras with heavy golem back-up who blocked the stairs while firing incredibly annoying balls of light from their high-tech rifles that followed you no matter where you dodged. After many deaths and an extortionate repair bill we managed to split them up and whittle them down. After that it was plain, if very stately sailing. The dungeon has a bit of a horror movie ending. Just 'cos you've killed the main villain don't think it's over, that's all I'm saying. Also, Bosses that have a "Kill Shot" ability that one-shots anyone are cheesy. Always have been, always will be. All in all it wasn't too bad. Far too long but that was probably because we weren't very organised. The story was about as engrossing as your average Saturday morning cartoon, there was an admirable absence of dance-steps to learn and I got a hat. Guys! Wait for me! I was just knocked out! Four more to do over the next two weeks, then. Not too terrible a prospect and I can't have had that bad a time because late last evening I was in another dungeon. Sort of. Super heroes don't really do dungeons. They do "Alerts". This one was on the Moon. In space no can hear you scream, which suits DCUO PUGs just fine because no-one ever speaks. 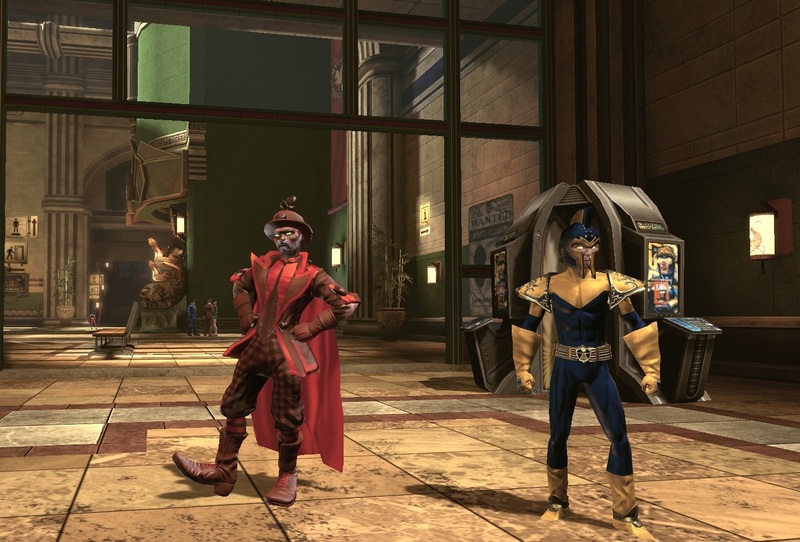 Hardly surprising since DCUO has the worst chat interface ever seen in a major (or minor) MMO. Also just as well because all I would have heard would have been "Who's the idiot in the clown suit and why is he dead all the time?". Luckily we had a level 30 slumming it in this (I think) level 18 recommended Alert. Other heroes came and went, a Green Lantern clone rolled "Need" on everything and then left half-way through. On the scorecard at the end he was flat bottom in everything so, nice run for him. I was second from last but at least I had the self-awareness to roll Greed, although only because no furniture dropped. By the final boss I was beginning to remember how the controls worked and what my abilities were. At least I made it through the last couple of fights alive. The whole thing took maybe twenty minutes and was fun all the time, even when I was being repeatedly pummeled to the ground. Now that I come to think of it, perhaps the villains targeted me because I was dressed as a circus clown they were driven berserk with envy over my Valentines Day finest. When I logged in I had mail and in the mail were Valentine's presents which brought a flurry, even a blizzard of unearned "Achievements" and the most ill-considered "romantic" leisure-wear I have ever seen. Let's not mince words - it's a clown suit. Someone in the SOE art department doesn't have a date for Valentine's this year, I'm guessing. So there you have it. What does it take to get me into a dungeon these days? Bribes, basically. But once I'm in there it's kinda fun. I guess that means I'll be going again. When SW:ToR finally hopped off the fence and set a date for what they refer to as "same-gender romance", a phrase that manages to be both clinical and coy at the same time, the long-awaited move attracted a lot of attention. Meanwhile, in a galaxy far, far away this kind of thing has been going on for years. Over in Norrath, Erollisi Day is back once again. Naimi Denmother has her usual, impeccable overview of what's new this time around and Zam has comprehensive and clear details for the entire event. 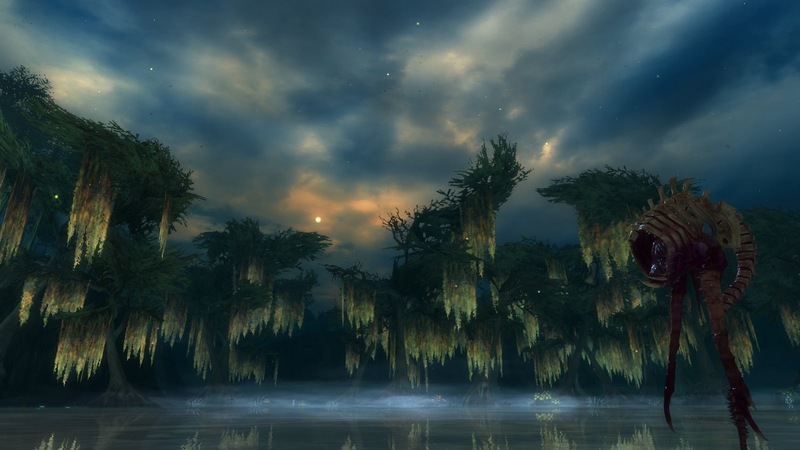 There are no new quests this year but there are extra rewards for some existing ones plus a new crafting book, so I took the opportunity of this morning's GW2 server maintenance to take a stroll round Freeport and smell the roses. Dalron Pinot has been setting up his Love Clinic on the East Freeport docks for six years now, offering classes on How To Pick Up Anyone Regardless Of Gender, Race, Species or Interest. He really doesn't care who he hits on and as you follow his lead it soon becomes apparent that he has a point - in Norrath anything goes! I've done this quest many times but every year it swings its fat, wet fish of gobsmackery full into my unsuspecting face yet again. 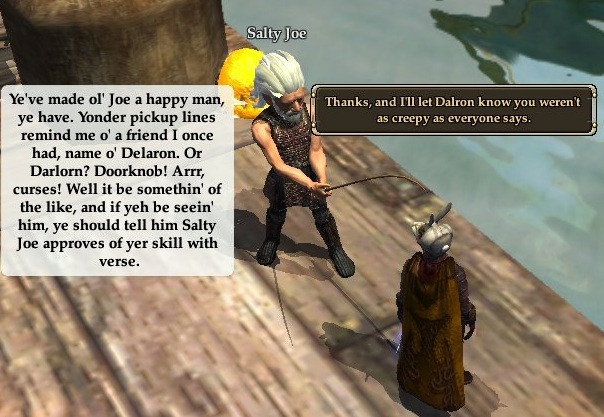 Armed only with a selection of pick-up lines that would get you bodily ejected from any self-respecting singles bar, and with a persistence that could only end with a court order, Dalron sends you out to walk the streets of Norrath's most unforgiving, corrupt, neo-fascist militarized seaport looking for love. Your mission, should you be suicidal enough to accept it, is to approach complete strangers and with no pre-amble of any kind launch into a hamfisted attempt to inveigle them into some kind of "romantic" tryst. Never mind if you happen to be a meter-high talking rat. Or, for that matter, a six-inch tall pixie. Don't worry about your own sexual orientation or that of your intended paramour. Don't worry if any kind of physical relationship between you would even be physically possible, let alone welcome. Just get in there and start flirting! Amazingly, rather than leading to armed combat, which would hardly be an unusual outcome for a quest or indeed any chance meeting in the streets and bars of Freeport, all your victims are either flattered, amused or take pity on you. No matter whether you're trying your weary lines on a muscular male dwarf in a vest, a bouffant-coiffed gnome with mental health issues or a Priestess in a Celibate order, everyone takes it all in good part. I love it. 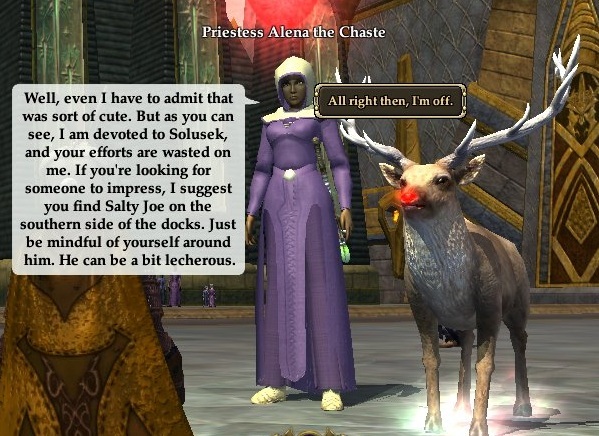 It's wonderful and bonkers at the same time, which just about sums Norrath up. Long may Everquest continue its admirable tradition of tolerance, open-mindedness and complete disregard of logic or sanity. 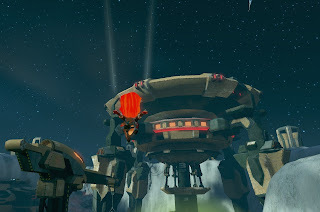 It better still be like this in EQNext, that's all I'm saying. This weekend saw the first of three short betas for Cryptic's upcoming D&D flavored MMO, Neverwinter. Massively have been giving the game extensive coverage but Tipa at West Karana has by far the best write-up I've seen. Last November I mentioned my interest but it had faded somewhat . Most of the information that trickled out didn't sound all that inspiring. I didn't even bother signing up for the beta, far less lay out $60 for the "Founder's Pack" so I could play three weekends then have my characters deleted. 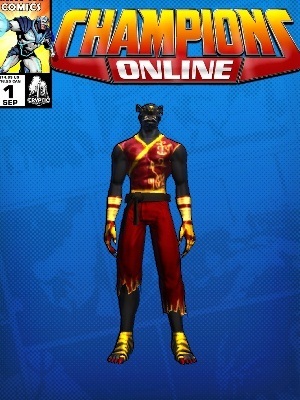 Oh, and then another three days with my real character before the game launches completely free-to-play. Yes, I know there's a mount and a companion and some other odds and ends but, really... $60 for three beta weekends a month or two before a full F2P launch? This seems to be a thing, though. City of Steam did it too and I guess if you know you are going to play the game and you know you are going to spend that much in the cash shop anyway, it does no harm to pony up in advance and have the benefit of beta. I can't pretend I won't be doing it for EQNext if the opportunity arises. Neverwinter, though, I am not that stoked for, but Tipa's piece and some of the comments on it have rekindled my interest, as have some of the videos and screenshots. It's still the Forge content creation system that I most want to get my hands on, but the game itself looks like it could turn out to be fun. 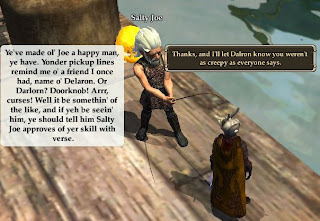 I played Dungeons and Dragons Online for a fair while, first in beta, when it was rubbish (and that's being generous) and later when it had been tarted up into something that could pass for a real MMO in a dim light. By then it had become sort of fun, but the reliance on repeating story-driven dungeons on increasing levels of difficulty struck me as ludicrous after a short while, so my stay was short. Another point against DDO was the Eberron milieu. It was unfamiliar and I can't say it grew on me much in the time I spent there. I'm no big-time D&D fan but I do know and like the Forgotten Realms setting and that alone makes me considerably more interested in Neverwinter. 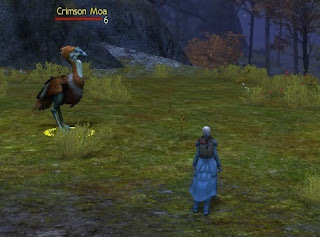 I also like what I've seen so far of Cryptic's MMOs. While neither Champions Online nor STO grabbed me, that had more to do with the genres they inhabited than anything about the way they were made. I found both of them clean in design, straightforward and pleasant to play. I have reasonable confidence that the House that made those could make a fantasy MMO that I would enjoy. There's still the action-MMO aspect to get past, but I found Shawn Schuster's negative impressions of Neverwinter's combat strangely encouraging. The very things he rails against, the hand-holding, the clunky, static movement, the lack of strafing, lead me to hope that there might not be all that much "action" after all. Anyway, not long to wait. 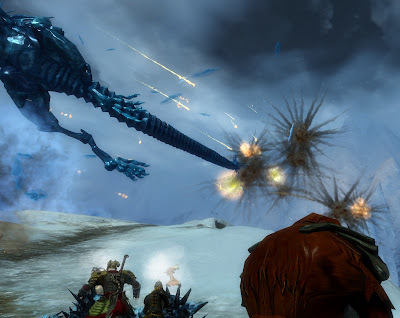 Neverwinter should be out in a couple or three months. I'm quite looking forward to it. When I began playing MMOs I didn't even know what a server was. I installed Everquest, stared at the list of incomprehensible names and decided to pick one I had an outside chance of remembering. Prexus. I learned the ropes on Prexus but after a while I dallied with other servers. 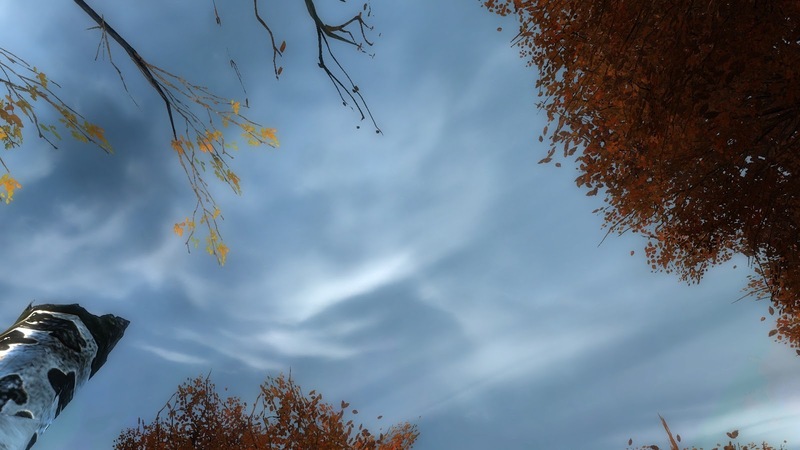 I tried Brell Serelis because I heard it was the unofficial role-playing server. I played on Test because, well, Test is Best. Then, as EQ waxed and new servers flowered I made sure to start a character on every one as it launched. 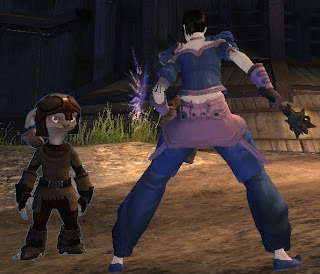 When time came to pick a legacy server for my characters in EQ2 I chose Luclin , even though when I go back to Everquest these days it's on Stromm that I mostly play. It fast became clear to me early that servers differed. DAOC forbade you to play different realms on the same server so it wasn't long before I knew the flavors of three. After that if I played any MMO for more than a month or two you could bet I'd have characters on more than one server and the theory held. Servers differ was the orthodoxy and the orthodoxy was true. Fast forward. Technology advances. Megaservers holding tens of thousands, even single servers hosting entire MMOs become possible. Just because something can be done, however, does not mean it should. For the last half-year I've played a lot of Guild Wars 2. GW2 mandates that all characters on an account play on a single server. This I loathe. For most of this time we had free transfers, which neither I nor Mrs Bhagpuss will countenance. The character belongs to the server on which he or she was born. Short of a server merge, there is no compromise with this. Now we have Guesting, which is an acceptable way to sniff different air, but guests, rightly, cannot carry the banner of their host world. World vs world remains the province of the server of one's birth and it is in WvW that proof can be found, should proof be required, that servers really do have communities, atmospheres, ambiances. Still. Even now. After all these years. Yak's Bend has battled many worlds. From the glory days against Tarnished Coast to the nadir when we threw ourselves despairingly onto Kaineng's swords, every match has hammered home the point: servers differ. If you doubt it, browse the forums. See the gulf in tone and content between the matchup threads these last two weeks when Yak's Bend, Crystal Desert and Stormbluff Isle sought to outdo each other only in politeness, mutual respect and diffidence and the Maguuma, Dragonbrand, Kaineng thread that took three attempts to get started before hostility levels fell below Moderator lockdown tolerance. Servers, shards, worlds, call them what you will, are the backbone of MMOs. If we lose this, we lose something precious. Let's not do that. In a comment on one of Ravious's posts over at Kill Ten Rats a while back I claimed it was possible to get all thirteen kills for GW2's Kill Variety Daily in the very first starting area of Plains of Ashford. I also said I'd take screenshots to prove it. It is, and I have. Since a couple of the creatures can't always be relied upon to be hanging around waiting for you to kill them at need you'll probably prefer to take a few steps just outside the Smokestead gate to the very beginning of the Old Duke's Estate just to save time. I have checked, though, and you can get both the Moa and Harpy kills while standing behind the gate itself, so they count! It's also very easy to do Daily Events here and I may do a separate pictorial guide to that at some point. For Daily Healer you'll find plenty of Fishers lying down on the job at Lake Feritas and the Armory and Scrapyard events leave flattened charr NPCs strewn all over just waiting for you to soothe them back to life. Gatherer is possible, although its not the easiest place to do it. Kill Count you can do anywhere, of course, and I guess you could Dodge something here although I haven't tried. 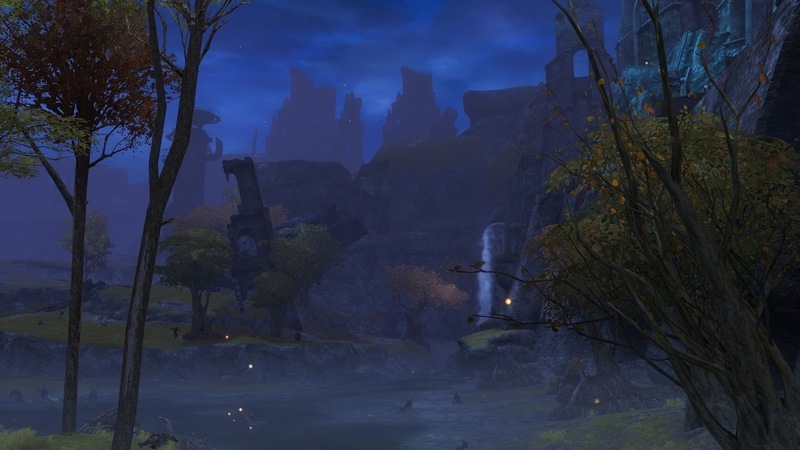 Crafting and the Laurel Vendor can be done in Black Citadel, which sort of counts, maybe, but for Aquatic and Veteran Kills I'm afraid you'll have to just hike up your robe and travel a few hundred yards into Plains of Ashford proper. 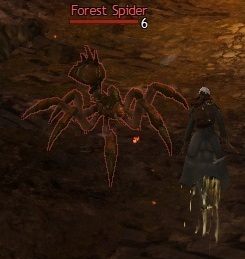 You'll see these ubiquitous little pests as soon as you come down the ramp from The Black Citadel. 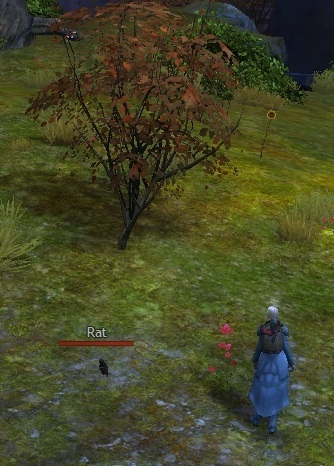 In Plains of Ashford you're never more than a few feet from a rat. The Scrapyard teems with them. The Flame Legion aren't too bright but there sure are a lot of them. They make repeated attempts on both the Armory and the Scrapyard and hole up in caves to the North and East of the lake. Don't worry if you can't find them; they'll come find you. Thanks to the legacy of the Foefire, nowhere in Plains of Ashford is entirely free of ghosts, although the infestation here is mild. Try along the west side of Lake Feritas or up on the ridge near the tunnel to Martyr's Wood. Lurking at the back of the Scrapyard (or wrecking yard if you prefer) you'll find plenty of these bile green gloops. Wear a rubber apron. Don't bother him, he won't bother you. Hyenas pad quietly through the scrub in front of Black Citadel and around the lake. Devourers are the dominant predator throughout much of Ascalon. 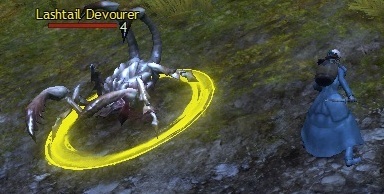 Charr have a strange relationships with these oversized scorpions, training them as warbeasts and developing an unlikely fondness for them as pets. You can scarcely go a yard here without stumbling over a lashtail. Fortunately these specimens are extremely docile. There are three exits from the starting area of Plains of Ashford. The obvious and safe exit is the big metal walkway going south-east from Smokestead. The other two are both tunnels, one behind Smokestead itself and the other going from the eastern ridge through to Martyr's Woods. Both tunnels are infested with vampire bats. Be wary of them. They are probably the toughest non-veteran creatures in the area and two at a time can kill you. Now we're getting a little more obscure. 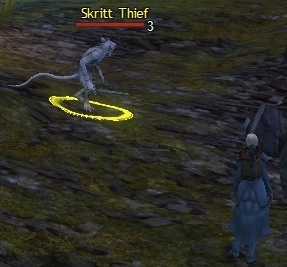 I'd spent a long time in the Charr training area before I came across the Skritt. 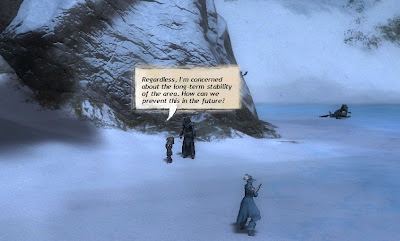 They live in a small cave behind Tela Range, where charr learn to fire cannons. Some unfathomable Skritt logic leads the little charmers to steal the cannonballs from time time triggering an event but there's no need to wait for that. Just pop one for your daily and do the skill point while you're up there if it's your first visit. 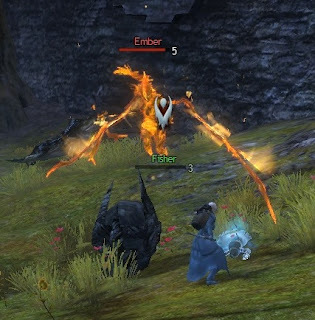 These flame elementals are easy to miss. They appear only when you destroy the Flame Legion braziers that line the paths up to the caves to the north of the lake. Moreover, once you have filled out Latera Painstorm's Heart you can no longer target the braziers so you're reliant on someone else to fan the flames. Remember when I said earlier that there are three ways out of the starting area? I lied. There are four. It's just that no-one in their right mind would use one of them. If you fight your way right through Facula Castrum, the north-west flame legion cave where the shaman appears for an event, you'll come to a tunnel. It goes to the extreme north of Martyr's Woods and it's full of spiders. Enjoy. This is an old photo from beta. 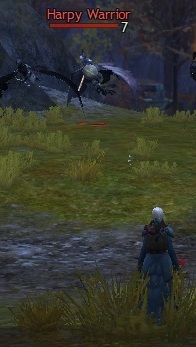 I waited for over an hour trying to get a shot of the tar elementals that spawn for an event in Lake Feritas. No luck. If they happen to be up, pop one. If not, don't fret. Plenty of other things to murder instead. Like the good old Moa, for example. For these you have to step just outside the Smokestead gate, where you'll see a pack (herd? flock?) of them careening up and down in that mindless way they have. I'm not sure why the kill variety requirement was reduced from the elegant fifteen to the rather awkward thirteen. Just in case it ever reverts, never fear! You can still finish it here, although you will have to take just a few paces out into the wider Plains. Harpies swoop in for an event that runs regularly even with no player involvement. It takes place immediately to the left of the Smokestead gate as you leave it, right where the mortars are. 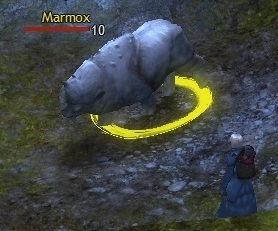 And no, I don't know what the plural of "Marmox" is. For some reason, this lumbering, armored rhino is level ten in an area where everything else, including you, is level six or seven. You might well decide he's not worth the trouble and go further into Ashford for grawl, wargs, bears or minotaurs, just to name a few. If anyone knows of anything else lurking in the area that counts, please chirp up in the comments and if I can get a photo of it I'll add it in.